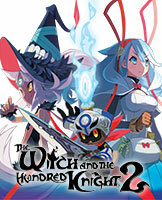 The Witch and the Hundred Knight™ 2 | NIS America, Inc. Follow the Hundred Knight in its journey through a witch-ravaged world. Young girls are contracting a strange illness and awakening as witches, causing mayhem across the region of Kevala. Along the Hundred Knight's side are two sisters: Amalie, an agent of an organization who opposes witches; and Chelka, the witch who awakened in Amalie's younger sister, Milm. Uncover the mysteries of Kevala as you protect them both from harm. Pint-Sized Powerhouse -- Execute Depletura to finish off enemies and replenish your GigaCalories! Trigger your Third Eye and unleash the full power of the Hundred Knight for a brief time. Leave enemies to tremble before your boosted speed, power, and skills!